Celebrating Ten Years of the Saint Paul Almanac! Saint Paul Almanac celebrates its first decade with a grand book release party for its new literary collection, Saint Paul Almanac: A Ten-Year Retrospective. 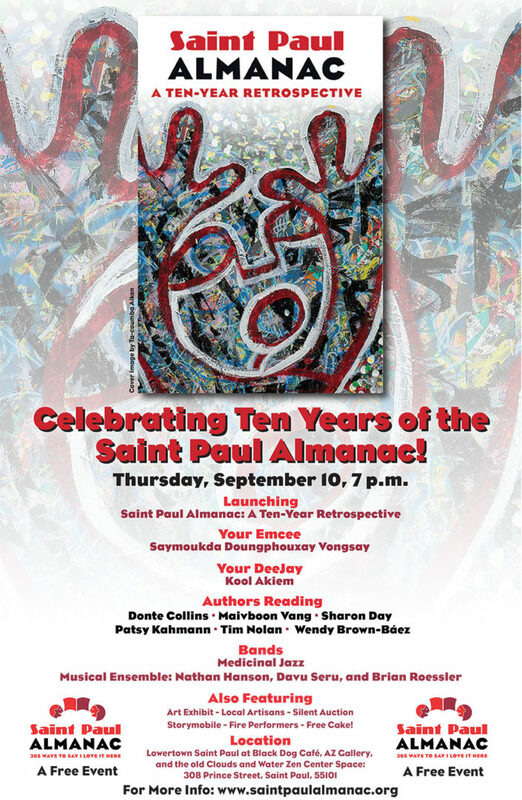 (Aug. 5, 2015) SAINT PAUL—The Saint Paul Almanac will celebrate its first decade of annual publications in its yearly book release party on Thursday, September 10, at the Black Dog Coffee and Wine Bar starting at 7 p.m. The new edition, Saint Paul Almanac: A Ten-Year Retrospective, celebrates the previous nine issues of the yearly book using selected pieces that highlight the flavor of the Almanac and the flavor of Saint Paul. As we do each second Thursday in September, Almanac lovers will pack the Black Dog and the adjacent AZ Gallery for the Almanac publication party. This year’s bash will feature background beats provided by one of the Twin Cities’ best DJs, Kool AKiEM. We will have readings from Almanac authors Donte Collins, Maivboon Vang, Sharon Day, Patsy Kahmann, Tim Nolan and Wendy Brown-Báez. The Medicinal Jazz Band will provide musical entertainment at the Black Dog Cafe, and the jazz ensemble of Nathan Hanson, Davu Seru and Doan Brian Roessler will play at AZ Gallery with a backdrop of an exhibit from local artists featured in the Almanac. The night’s emcee will be writer, playwright, teacher and performer Saymoukda Duangphouxay Vongsay . The event will also include a silent auction, our ever-popular Storymobile and, as always, CAKE! This 2016 edition is made up of selections from all the previous editions of the Almanac, compiled by a group of community editors* who read through hundreds of stories from each book. Unlike other editions of the Almanac, this anthology is a literary collection of stories and poems alongside a collection of Saint Paul–themed art and photographs. Contributors include award-winning authors, poet laureates, professional writers and neighbors who sometimes shared their stories for the first time via the Almanac. The Black Dog Coffee and Wine Bar and the AZ Gallery are at 308 East Prince Street in Lowertown. Everyone is welcome to this free event. How long is the exhibit at AZ Gallery?